Australia have been saying for years that they wanted a game from their oldest rivals. Whether they quite had Edgbaston, Old Trafford and Trent Bridge in mind is another matter. NOTTINGHAM: Australia captain Ricky Ponting and batsman Simon Katich were both fined for their part in two separate incidents during the fourth Test against England at Trent Bridge. Pakistan Cricket Board’s fixation with organising matches in Karachi seems unending as even after refusal by various teams it has proposed to host a Test and one-dayer in the volatile port city during India’s next tour to the country. Bangladesh open their tour of Sri Lanka on Wednesday with the first of three one-day internationals amid hopes that the fledging cricket nation will build on their greatest success two months ago. Lt-Col Rajyavardhan Singh Rathore received the Rajiv Gandhi Khel Ratna Award — the highest sports honour in the country — from President APJ Abdul Kalam during an awards investiture ceremony at the Ashoka Hall of Rashtrapati Bhavan here today. The nation today celebrated the 100th birth anniversary of hockey wizard Dhyan Chand, one of the world’s greatest ever players, who helped India to win three Olympic gold medals. He took hockey artistry to a sublime level to remain a source of inspiration for the new generation of players even now. The Rabo Bank trophy winning Pakistan team was feted by Prime Minister Shaukat Aziz who announced cash rewards of Rs 5 lakh for each member of the victorious side. Pakistan clinched the eight-nation Rabo Bank Trophy tournament in Holland on August 21. Vanita Thakur of Punjab Police won the women’s 5000 metre walk in the Punjab State Athletic Championship taking place at Mastuana Sahib. The second place went to Rupinder Kaur of Amritsar while Sukhjit Kaur of Bathinda was third. The 52nd Senior Punjab Boxing Championship for men concluded today at Mastuana Sahib. Boxers from Patiala and STC won most of the final bouts. Mr Sukhdev Singh Dhindsa, MP, gave away prizes to the winners. Kendriya Vidayalya No. 2, aided by a hat-trick by striker Dev Ashish, downed Patiala block 5-1 while Nabha `A’ beat Patiala ‘B’ by 3-0 in the Patiala District Football Championship which commenced at the Polo ground here today. National Sports Day and the 100th birth anniversary of hockey legend Major Dhyan Chand was celebrated by the National Institute of Sports authorities by holding a “Run for Sports” for both men and women here today. Irfan Pathan produced a devastating spell of swing bowling as India brushed aside Zimbabwe with a resounding 161-run victory in the Videocon Cup cricket tri-series match here today. After a stuttering batting performance that saw them post a competitive 226 for six, the Indians shot out the hosts for a paltry 65 in 24.3 overs, with Pathan wrecking the inexperienced batting line-up with five for 27. Only Heath Streak and Prosper Utseya managed to reach double figures as the hosts recorded their third lowest ODI total in what turned out to be a totally lopsided contest at the Harare Sports Club. The wiry Ajit Agarkar also shared the spoils with four for 18 as the Indian pace bowlers exploited the conditions brilliantly to give India their first victory in the tri-series. It was Zimbabwe’s 35th defeat in the past 40 matches, marking one of the longest losing streaks dating back to 2003-04, punctuated only by a no result against Australia in 2004-05 and two wins each during their tour of Bangladesh and a home series against the same opponent. Zimbabwe had reasons to hope for an upset win after they restricted India to 226 for 6 but then their batting came apart in the face of some high-quality fast bowling by Pathan, who registered his best figures in ODIs, and Agarkar. Pathan and first-change Agarkar shared all but one wicket and most of the dismissals were by way of bowled and lbws as Zimbabweans looked completely clueless and technically ill-equipped. The biggest stand for them was for the last wicket when Streak and Utseya (11) added 18 runs in the last-ditch stand. The cry for Zimbabwe’s ouster would again pick up in international arena as the hosts continue to plunge deeper and deeper into cricketing quagmire. This was the 12th smallest any team has managed in one-day internationals. Earlier, Mahendra Singh Dhoni (56) and Yuvraj Singh (53 not out) put on 103 runs for the 87-ball fifth wicket stand which gave a semblance of respectability to the doddering Indians against a midget-weight opposition in Zimbabwe. Dhoni brought up his half century with two consecutive sixes against Andy Blignaut in the 48th over and Yuvraj’s straight six in the final over hurtled India towards their final score. Mohammad Kaif made a cautious 65 as he steered the innings out of early trouble when Venugopala Rao was dismissed in the first over. The Indians continued to experiment with their batting line-up, with Rao taking over the opener’s role from Virender Sehwag, who did not play in the match as he was indisposed. Kaif added 52 runs for the second wicket with captain Sourav Ganguly who made a sedate 20. Anthony Ireland was the pick of the Zimbabwe bowlers with three for 54. India crawled for most part of their innings, initially cautious against the new ball in helpful conditions and then almost strokeless against the off-spin twin of Prosper Utseya and Gavin Ewing in the middle overs. India were straightaway on the backfoot when Rao, promoted as opener, departed in the first over, edging Streak behind the stumps to Taibu. Ganguly departed in the 16th over when unable to get going, he tamely spooned a catch at fly slip on the leg-side against the medium-pace of Ireland. He batted for 28 balls for his 20 runs including two fours. The spinners then took over and tied the batsmen in knots. Rahul Dravid tried to play a forcing stroke on the onside but was bowled through the gate for 14 runs. His dismissal suddenly saw batsmen see the spinners in a new light. Kaif departed in the 26th over when he pushed Ewing down the track and the bowler dived to his right to pick up an outstanding catch. Kaif’s 65 from 122 balls was a tardy effort. So slow were the Indians that one stage only one four was hit from 20 overs. There was the understandable push from the Indians in the final 10 overs which yielded 80 runs as Dhoni and Yuvraj shifted gears. Most of the thrust came from wicketkeeper Dhoni who hurled his bat at everything and even flicked Ireland over square leg for a six. The wicket was slow and made batting difficult yet the Indians were largely concerned with self-preservation and it hurt the team’s scoring. Fall off wickets: 1-3, 2-55, 3-95, 4-121, 5-224, 6-225. Bowling: Streak 10-1-32-1, Mahwire 4-0-19-0, Ireland 10-0-54-3, Blignaut 8-1-46-0, Utseya 10-0-44-1, Ewing 8-0-25-1. Fall of wickets: 1-7, 2-17, 3-17, 4-24, 5-30, 6-30, 7-35, 8-36, 9-43. To have been outplayed once by England was unfortunate. For it to happen twice, and then a third time in going 2-1 down with one to play in the five-match Ashes series, will probably be judged as unpardonable by their supporters and selectors. No one will know that better than Australia captain Ricky Ponting. Heads will surely roll in the coming months, even if the marvellously resilient Australians somehow turn back the clock in the fifth and final Test at The Oval next month to level matters and retain the Ashes. Whatever happens, there is an unmistakable sense of an era approaching its end, a dynasty precariously short of worthy successors. The whispers began during the second test and have grown to a clamour since. Ponting is a world-class batsman but knows he will go down in history as, at best, the man who failed to extend Australia’s record run of eight Ashes triumphs in a row. His cheeky early-tour grin long gone, he has consistently been out-thought by his England counterpart Michael Vaughan. Ponting admitted blundering by putting England in first at Edgbaston, a decision which reportedly led to frank words with a less-than impressed Shane Warne. Australia denied a rift but duly lost the match, albeit by two runs. At Trent Bridge, Ponting lost his cool after being run out by a specialist substitute fielder. Spraying abuse liberally, he headed straight into a hearing with the match referee. The resulting fine mattered less than England’s delight at having rattled the world champions’ captain. If Ponting’s neck feels exposed, so will too that of Australia coach John Buchanan. Buchanan was once regarded as an innovative, off-the-wall thinker. When you win, encouraging poetry reading and quoting from the ancient texts of Chinese warlords is regarded as blue-sky brilliance. When you lose, it tends to attract derision from friend and foe alike. Ponting was fined 75 per cent of his $ 9,400 match fee and Katich 50 per cent following a hearing conducted on Sunday after England won by three wickets with more than a day to spare to go 2-1 up in the five Test series. Ponting was in trouble after reacting angrily having being run out on Saturday by substitute Gary Pratt’s direct hit for 48. Pakistan Cricket Board’s (PCB) fixation with organising matches in Karachi seems unending as even after refusal by various teams it has proposed to host a Test and one-dayer in the volatile port city during India’s next tour to the country. The PCB has sent a proposal to their Indian counterpart about hosting a Test and a one-dayer at National Stadium Karachi (NSK) during their visit to Pakistan early next year. “Karachi is a premier Test centre of the country and we certainly would like the Indian team to play Test and ODI at NSK,” PCB Chairman Shaharyar Khan was quoted in the local media as saying. Shaharyar said the proposal had already been sent to Board of Control for Cricket in India secretary S.K. Nair and PCB Director Operations Saleem Altaf would be discussing the matter with him on the sidelines of the ICC Chief Executives’ Committee meeting in Dubai which concludes today. India had refused to play in the strife-torn city in its last tour citing security reason as had New Zealand and England. The five-wicket win over world champions Australia in Cardiff on June 18 — the biggest one-day upset in history — would have buoyed Bangladesh’s confidence, but the challenge they face over the next four weeks is daunting against the competitive Sri Lankans. Bangladesh, led by Habibul Bashar, are also scheduled to play two Test matches against Marvan Atapattu’s men after the one-day series. Bangladesh have lost 33 of their 38 Test matches since being granted Test status in 2000, their lone win coming against a depleted Zimbabwe at home last year. Four matches were drawn. Rathore, who became the first Indian to win an individual silver medal in the Olympics when he hit the bull’s eye in double trap shooting at Athens last year, said he could compare his elation only to that of the moment when he won the coveted medal. He said he would strive to excel in the Beijing Olympics three years from now, adding that he had been working hard to perfect his skills. 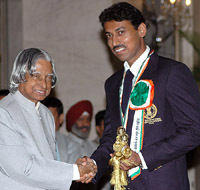 Rathore received the Arjuna Award last year, as an immediate reward for winning the Olympic silver. Before him, the individual Olympic medals — all bronze — were won by KD Jadav (wrestling), Leander Paes (tennis) and Karnam Malleswari (weightlifting). Rathore has won several medals in international competitions and holds the national record in double trap shooting. The Khel Ratna Award included a cash award of Rs 5 lakh, while the winners of the Dronacharya Award and Arjuna Award received Rs 3 lakh each. Surprisingly, the biggest applause from the packed hall was not reserved for Rathore, but for veteran grappler Maruti Dnyanu Mane Patil. Wearing a saffron-coloured coat and a printed headgear, Mane hobbled on, assisted by a Sikh Services officer, to receive the Dhyan Chand Award from Dr Kalam. The 67-year-old Mane was given the award for his lifetime achievement in wrestling. He was fifth in the 1964 Tokyo Olympics, and won a gold in freestyle and silver in Greco-Roman in the 1962 Jakarta Asian Games. He also won a gold medal in the 1970 Edinburgh Commonwealth Games and dominated the country’s wrestling competitions for several years. Six of the award winners were women, including cricket coach Sunita Sharma. Though no cricketer was selected for the Arjuna Award, Sunita Sharma, who was the first woman to secure a diploma in cricket coaching from the NIS, Patiala, in 1976, after being through with her playing career, was third-time lucky when she was selected for the Dronacharya Award. Her name was recommended twice in the past, when wicketkeeper-batsman Deep Das Gupta made his India debut and women cricketers Anju Jain and Anjum Chopra led the country in women’s cricket. A famous figure among cricket coaches, her centre at the National Stadium in New Delhi is a throbbing place as it has produced a number of talented players. Cyrus M Poncha became the youngest Dronacharya Award winner at the age of 30, though he looks good to play the game at the top level for many more years. He represented Tamil Nadu from 1989 to 1995, and then successfully completed the Level III coaching diploma from the Asian Squash Federation in 2000 — the highest qualification in squash coaching in Asia. Though tennis ace Sania Mirza was not present to receive the Arjuna Award, her mother got a big applause when she walked up to the President to receive the honour. Sania is playing in the US Open. Other prominent absentees were athlete Anil Kumar, women’s hockey team captain Innocent Helen Mary and table tennis player Achanta Sharath Kamal. When the name of badminton player Abhinn Shyam Gupta was called out, there was palpable tension among some of the mandarins from the Sports Ministry and the Press Information Bureau. Abhinn’s name was omitted from the list released through the PIB by the Sports Ministry. The goof-up created a major stir in the ministry as Mr Prithviraj Chavan, who is looking after the ministry after the death of Sunil Dutt, is likely to fix up responsibility for the lapse. The eroding popularity of hockey was evident in the lukewarm response received by Deepak Thakur and coach Rajinder Singh Jr.
Guru Nanak Dev University Vice-Chancellor SP Singh received the Maulana Abul Kalam Azad Trophy. The university has won this trophy for the record 19th time. This year’s function lacked the normal sheen, and very few sports officials and top sportspersons were present. Indian Olympic Association President Suresh Kalmadi and Board of Control for Cricket in India vice-president Rajeev Shukla were the notable exceptions. Rajiv Gandhi Khel Ratna Award (2004): Lt-Col Rajyavardhan Singh Rathore (shooting). Dronacharya Award (2004): Arvind Savur (billiards and snooker), Sunita Sharma (cricket) and Cyrus M Poncha (squash). Arjuna Award (2004): Anil Kumar and JJ Shobha (athletics), Abhinn Shyam Gupta (badminton), Deep Kumar Alhawat (equestrian), Jyoti Randhawa (golf), Deepak Thakur (hockey), Helen Mary (women’s hockey), Angom Anita Chanu (judo), Sunder Singh (kabaddi), Jenil Krishnan (rowing), Deepali A Deshpande (shooting), Achanta Sharath Kamal (table tennis), Sania Mirza (tennis), Anuj Kumar (wrestling) and Devendra (handicapped athletics). Dhyan Chand Award (2005): Manoj Kumar Kothari (billiards and snooker), Rajinder Singh Jr (hockey) and Maruti Mane (wrestling). 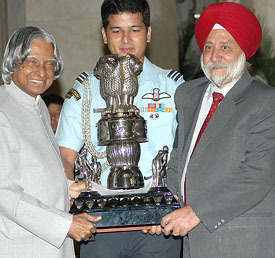 Maulana Abul Kalam Azad Trophy (2003-04): Guru Nanak Dev University, Amritsar. Tenzing Norgay National Adventure Awards (2003 and 2004): Harish Kapadia, Mohan Singh Gunjyal, Nb Sub Amar Prakash, Nadre Sherpa, Cdr Jayashankar and Mayur J Mehta. After his exploits with the gun at Athens Olympics where he became India’s first individual silver medallist, marksman Rajyavardhan Singh Rathore is all set to becoming the first Army man to endorse products after the Defence Ministry gave him the necessary go-ahead. 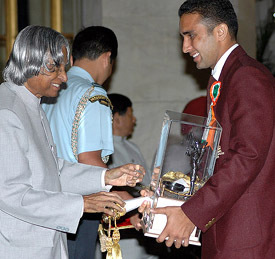 Rathore, who received the nation’s highest sports award — the Rajiv Gandhi Khel Ratna from President APJ Abdul Kalam today — said his case has received the Defence ministry’s approval. At present a Lieutenant Colonel, Rathore has already signed with Collage Sports Management and his on-the-field performance, coupled with verbal skills could make him an advertiser’s delight, feel experts. With darkness and despair surrounding the Indian hockey, the latest jolt being in the form of a lowly seventh-place finish at the mini world cup at Amstelveen, the news of Arjuna Award for Deepak Thakur has come as a whiff of fresh air for the Indian hockey in general and the Patiala-based player in particular. The indefatigable Deepak has become the third sportsman from Patiala to have been awarded the Arjuna Award, the other two being hockey guru Balkishen Singh, percieved to be one of the finest coaches the country has ever produced, and Harmik Singh, Captain of the Indian team that took part in the 1972 Munich Olympics. Indeed, for Deepak Thakur, ever since he was declared ‘Player of the Tournament’ in the Surjit Memorial tournament in 1997 at Jalandhar, the road to stardom has been paved with hurdles. However, what has held him together is his resilience, grit and courage to defy odds which, on many an occasion, had been heavily stacked against him. Deepak Thakur, along with his colleagues— Prabhjot Singh, Sandeep Singh and Kamaldeep Singh — is a product of the immensely successful Centre of Excellence, a SAI-sponsored scheme, which unlike some other unprofitable SAI schemes, is a result-oriented one and is managed with a flourish by senior hockey coach Mr I.S Gill at the NIS here. The 25-year-old Deepak Thakur, a former student of the Government Mohindra College here, made his debut in the junior category in the international hockey when he turned out for the country against Russia in an under-21 year test series in 1997. There, he impressed one and all with his agility, deft stick work and above all his capability to weave circles in the defensive phalanx set up by his rivals also surfaced in abundance. At that time even the Russian coach J.Pleshakov was highly impressed by young Deepak’s abililty to penetrate rival defences with consummate ease. Deepak, whose younger sister Navita Thakur is a national-level badminton player, came in for praise when he pumped in as many as 18 goals during the 1999 junior nationals held at Bangalore while playing for the Air India Academy. He was quickly elevated to the captaincy by his employers— the IOC— and during the 2000 Jammu senior nationals, Thakur skippered his departmental team to a podium finish. 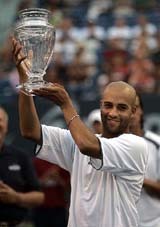 The high point of his career came when he was selected as understudy to Gagan Ajit Singh for the 2001 junior world cup held in Hobart. At the tournament, he bamboozled rival defences with his lightening quick speed-making repeated forays in the opposition territories. Ten goals in the tournament, including a fine hat trick in the final against Argentina, meant that one of the world’s best-known coach Ric Charlesworth extolled virtues of Thakur’s capabilities as a top drawer player openly in the Australian media. Right now the Hoshiarpur-born player, an Assistant Manager with the IOC, is a veteran of two Olympics —Sydney (2000) and Athens (2004)— and is eyeing two more editions of the games. This in itself is a tribute to his fitness and ability to perform consistently at the highest levels of the game. The exploits of players like Deepak Thakur, Sandeep Singh, Prabhjot Singh and other international-level players like Kamaldeep Singh, Gurjant Singh, Jagbir Singh, Preetinder Singh and the highly talented Pawan Bassi has put the spotlight firmly on the Centre of Excellence. The Centre, which was earlier known as the Sports Promotion Development Area (SPDA) project, has produced innumerable international and national-level players and is now looked upon as a leading nursery of young players, leaving far behind the legacy of Sansarpur. The man deputed by SAI to coach youngsters at the Centre is Mr I.S Gill, whose list of accomplishments is as impressive as the achievements of any other Dronacharya awardee. For the record, Thakur has also played in two editions of the Champions trophy — Amstelveen (2003) and Cologne (2004) — and the 2002 Busan Asiad. A player whose mere mention sent rivals scuttling for cover when he weaved magic with the stick in the pre-Independence era, Dhyan Chand was remembered by his 10 children who organised a special family reunion in Jhansi, where the legend spent most of his life. Here in the capital, an exhibition match was held between a developmental side and the seniors to mark his birth anniversary which is also celebrated every year as National Sports Day. The Arjuna Awards are also conferred on this very date every year and as this time it coincided with the birth centenary year, it was all the more special for ace forward Deepak Thakur. “I am doubly thrilled to receive this honour as today is Dhyan Chand’s birthday,” said Deepak after he collected the award from President A.P.J. Abdul Kalam. Thakur said it had been Dhyan Chand’s unfulfilled dream to win the Champions Trophy at home and the Indian team would give its best when the country hosted the elite tournament in Chennai in December. And if the team is looking for inspiration in these difficult times, what better role model than Dhyan Chand who, legends say, could take on the entire opposition single handedly when he scorched the field in the 1920s and 1930s. Legend has it that after seeing him play at the 1936 Berlin Olympics, Adolf Hitler offered him the post of Major and German citizenship, but he refused. It is said there were attempts to break his stick in Holland to check if there was a magnet inside and in Japan they wanted to see if there was glue inside the stick because the ball appeared to be glued to his stick. For two decades, until he bid goodbye to international hockey in 1948, Dhyan Chand, who was born in Allahabad scored goals aplenty, creating new records. During a 1935 tour of New Zealand and Australia, he scored 201 goals out of the team’s 584 in 43 matches. In 1928, he exhibited his skills in England, netting 36 of India’s 72 goals in 10 matches at the London Folkstone Festival. At the Amsterdam Olympics, he netted twice in India’s 3-0 win over the Netherlands in the final. In the 1932 Olympics, when India trounced USA 24-1 — a world record until a couple of years ago — Dhyan Chand’s contribution was eight goals. The same year, he netted a whopping 133 goals out of India’s 338. In 1936, on the Indian team’s world tour, he netted 59 goals out of the team’s total of 175. However, Dhyan Chand was at his mesmerising best at the Berlin Olympics. The Germans were so scared of him that they resorted to rough play in the final, which resulted in Dhyan Chand losing a tooth! But not the one to be deterred, he came back to pump in six goals and guide India to an 8-1 win. It is not surprising then that in Vienna, there is a statue of Dhyan Chand which shows the Indian as possessing four hands and four sticks! HYDERABAD: The Andhra Pradesh Government on Monday paid rich tributes to Dhyan Chand on his birth centenary, by unveiling his statue in Medak, about 130 km from here. “As a symbol of government’s patronage of hockey, I raise the per-member cash reward for the Rabo-winning squad from Rs 2 lakh to Rs 5 lakh,” the local media quoted the Prime Minister as saying at the reception hosted at his residence. The Prime Minister, who is the Patron-in-Chief of PHF, also pledged all support and facilities, particularly for laying Astro-turfs around the country, from the government. Results: 5,000 m, walk (boys u-18): 1. Parminder Singh (Jal) 2. Inder Singh (Ropar) 3, Gurmukh Singh (FGS). 5,000m walk (girls u-18): 1. Baljit Kaur (Sgr) 2. Kiranbir Kaur (Asr) 3. Amarjit Kaur (Asr). 5,000 m. walk (men): 1 Ravinder Singh (Sgr) 2. Jasvir Singh (PSEB) 3. Bhupinder Singh (PP). 5,000 m. walk (women): 1. Vanita Thakur (PP) 2. Rupinder Kaur (Asr) 3. Sukhjit Kaur (Bth). 5,000 m. walk (boys u-20): 1. Satnam Singh (Sgr) 2. Makhan Singh (Pta) 3. Dharminder Singh (Ropar). 5,000 m. walk (girls u-20): 1. Savita Kumari (Asr) 2. Ranjit Kaur (Hsp) 3. Priya Bawa (Ldh). Results: Light fly wt: Amandeep Singh (STC) b Pushkar Singh (Pta). Fly wt: Shiv Kumar (Ldh) b Gagandeep Dutta (Pta). Bantam wt: Kulwinder Singh (STC) b Anil Kumar (FGS). Feather wt: Sandeep Dutta (Pta) b Raminder Singh (NS). Light wt: Pawan Kumar (PP) b Narinder Singh (Sgr). Light Welter wt: Nirpal Singh (Pta) b Ranjit Singh (STC). Middle wt: Birender Singh (Pta) b Parminder Singh (STC). Lt Heavy wt: Parminder Singh (Pta) b Jagtar Singh (PP). Heavy wt: Gurvir Singh (Ldh) b Narinder Kumar (Sgr). Super Heavy wt: Manpreet Singh (STC) b Jaspreet Inder Singh (Pta). Kendriya Vidayalya No. 2 (DMW), aided by a hat-trick by striker Dev Ashish, downed Patiala block 5-1 while Nabha `A’ beat Patiala ‘B’ by 3-0 in the Patiala District Football Championship which commenced at the Polo ground here today. In the first match, Kendriya Vidayalya started with a flourish with Dev Ashish packing enough punch in his game to score the first hat-trick of the tournament. Midfielders Faiz and Nipin added a goal apiece while Navkaran Singh managed to reduce the margin for Patiala block with a lastminute effort. In the second match of the day, a solo effort by Sunil Kumar enabled his team, Nabha ‘A’, to open the scoring. In the second half, Patiala ‘B’ repeatedly floundered in the defence which enabled their rivals to pump in two more goals to close the match at 3-0. In the last match, Manjit Football Club rode on a fine brace by Satwinder Singh to down a lackluster Nabha ‘B’ by 3-0. National Sports Day and the 100th birth anniversary of hockey legend Major Dhyan Chand was celebrated by the National Institute of Sports (NIS) authorities by holding a “Run for Sports” for both men and women here today. Other events held to commemorate the day were hockey matches, tug-of-war and fun events, for children. The “Run for Sports”, in which staff members, senior citizens and regular morning walkers took part, was flagged off by the institute’s Regional Director, Mr L.S. Ranawat. The highlight of the programme was the participation of the 13-member Pakistani judo team which arrived at the NIS on Saturday under the cultural exchange programme. CHANDIGARH: The National Sports Day was celebrated by the Department of Physical Education, Government College, Sector 11, by organising various events here today. The event started with a rally at Sukhna Lake, in which over 150 students took part. Dr N.S. Mann, ex-Chairman, Department of Physical Education, Panjab University, flagged off the rally. “The purpose of the rally was to create the awareness in general public about the role of physical activities in one’s life”, said Dr R S Brar, head of the Department of Physical Education of the college. To observe the day, various matches were played on the college campus. In a football match between the teams of Manipur and the college team, the latter got the better of the former by 1-0. The BPEd (Ist) team beat the General Hostel team in tug-of-war. The basketball, volleyball and swimming competitions were also held between the college teams. The department also honoured football player Jatinder Kumar, who had represented the country 13 times in the international events and got ‘A’ grade NIS coaching diploma in football. under-13 and Ramandeep and Yuvraj for under-10 category. Among girls, Harmandeep and Manpreet were selected under-16 and Babita under-13 category, said president of the District Badminton Association, Mr R.S. Parmar, here today. NEW DELHI: The zonal rounds of the Nike Tennis Tournament will be held in Chennai, Delhi, Kolkata and Mumbai. The tournament is for boys and girls in the age groups of under-12 and under-14. The North Zone Nike Tennis Tournament will be held at the R.K. Khanna Tennis Complex in New Delhi on Tuesday. The winners from the four regions will play in the Masters in Bangalore from October 3. The winners of the Masters will be given an all-expenses paid trip to the NJT International Masters to be held at Sophia Country Club, Nice, Italy, from October 31 to November 5. SANGRUR: Mohammad Salim won both the single’s and doubles titles in the men’s section in the District Badminton Championship which concluded here on Monday. Hussan Lal, Deputy Commissioner, gave away prizes to the winners. In the men’s single final, Mohammad Salim defeated junior Punjab champion Aslam 15-11, 15-12. In the doubles final, Mohammad/Zeeshan beat Aslam/Gurdeep Singh 15-13, 15-13.